It's Monday Made It with my friend Tara! (I'm back to school today, students return next Monday). I made some goodies for my teammates to get them excited about being back to school! I got this adorable idea from Around the Kampfire. Now, let me just say...it's not that easy finding Chevron composition books! After scouring all the office supply stores, I found them at Walgreen's (well, I had to go to three different ones to get enough!). I think our meetings will be more fun with these notebooks! :) I only have 4 teammates, but I have to make them for my children's teachers and a few close friends! I also made them these teacher goodie bags! These bags included pens, whiteout, highlighters, pencils, post-its, and post-it labels. I like to spoil my teammates and friends and get them excited about their summer ending! We have an AMAZING office staff at our school. I made these personalized hand sanitizer bottles. This is just a transparency placed inside the bottle! Print whatever you'd like on a transparency (laser printer), cut it out, roll it and place in the bottle. I used an orangewood stick to position it. Tie a cute ribbon around it. Voila! Are you ready to see the ultimate guided reading cart??!! I can't even tell you how excited I am about this project!! As soon as I saw this cart I fell in love with it! Let me tell you about this beauty! It's on wheels, the drawers are white plastic, so it can hide clutter if it's not organized, the drawers come out of both side so you can use it a tub, AND the bottom drawer can hold hanging file folders!!! Do you have goose bumps, are you salivating, are you already in your car driving to go get one?? LOL! I used full size labels to decorate the front of my cart. The first drawer has all my "reading rings", Citing Evidence Rings, Interactive Reading Comprehension, Non-Fiction Text Features, Reading Questions: Before, During & After. The second drawer holds our Reading Response Menus. And the bottom drawer will be used to hold my Guided Reading With Post-Its Binder, lesson plans, graphic organizers, Scholastic News, and incomplete group work. This cart is going to be such a wonderful addition to my classroom! It will keep me organized and all my materials at my fingertips! It's made by Hefty and I bought it at Target (not sure if other retailers carry it or not). 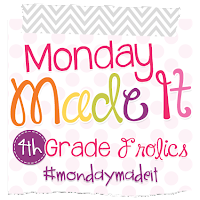 My last Made It is my most recent product: Back to School Reading & Writing: Activities to Build Community in Your Classroom. This summer I finally compiled all the activities and mentor texts I use with my class at the beginning of every school year. This is one of my favorite times of the year when we get to bond and form our class family. I love the discussions these books bring to our classroom. These texts and activities will be remembered all year! I've selected popular books that can be found in most media centers or local libraries, but I've also included SafeShare video links to all of the books to listen/watch online! I'd like to give at least one away! Pin either image of my product, copy & paste the URL in the comments, and include your email address so I can send you the prize! I will giveaway one pack for every ten comments made! Winner will be notified Wednesday. 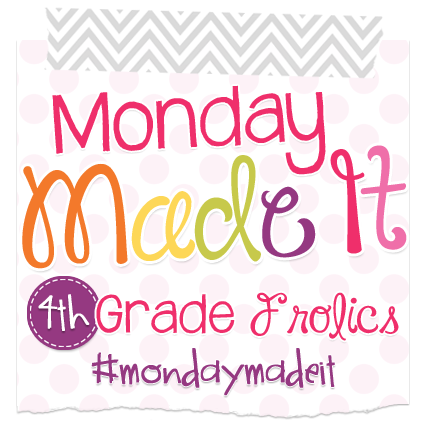 Be sure to check out all the other fabulous ideas linked up to Fourth Grade Frolics! I love your reading cart! Everything looks so awesome and organized! Always so thoughtful and creative! I love your website! Thanks for sharing your wonderful ideas! I don't have a computer at home right now, so I did this on my iPad, but I can't figure out how to copy the URL from Pinterest because it doesn't show on the app. So I pinned it in Pinterest, shared that to Facebook (tagging you) and now I'm attempting to share the link here. Here's hoping I win! Amazingness, as always! I love that guided reading cart. I'm heading to Target later today to get one. I hope you have a great year, Joanne! I'm looking forward to reconnecting now that the craziness of summer is over!! Intrigued by the cart... have looked at a few different carts this summer and haven't decided yet if I need one, but your ideas for what to put in each drawer are compelling. Thanks for the ideas! Those little teacher gift bags are perfect! Last year, I remember Wal-Mart had a ton of great chevron products, but I haven't seen them this year. Target is even short on cutesy stuff like that. Love your teacher gift ideas! Oh my heavens gracious. That is one AMAZING reading cart!! LOVE!!!!! Do you have the files for the teacher goody bags and the sanitizer or do you sell them in your TpT store?